I hate putting this as the designer to watch, because I know this designer has been around for a while now. But this is my blog and I get to do what I want...LOL. The dress above really tickled my fancy, so I wanted to share. 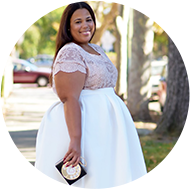 Dearcurves is the brainchild of plus size model and fashion designer; Linda Idegwu. (Sidenote: She is gorgeous.) Dearcurves combines African fabrics with western design to create ready to wear fabulousness. Price points hover around $75 - $125. I have yet to really incorporate African prints into my wardrobe. Dearcurves makes me want to really give it a try. DearCurves has more pieces available here. I also heard that their will be a new spring collection on it's way, so keep up with the arrival of new looks through their Facebook page. I am curious to see what spring will have to offer. I can really see myself including of of these pieces in my everyday wardrobe. What do you guys think of the line? LOVE all of this! I've been looking for African print outfits since last year, but it was tough to find anything I really liked in my size. I'm swooning over these designs and will definitely be bookmarking them for a future purchase. Thanks for introducing me to them! Thanks, Chastity; I wasn't familiar with DearCurves. I really, really love prints and pattern, so a lot of this is right up my alley. The size chart seems on target, too (something I always look at). I even liked the bags! Might have to give them a try. Those are some intense prints. AAAAWWWW this is so cute, well be looking for them! This stuff is gorgeous. I especially love the green dress, so beautiful! Thanks for sharing. I love this style and I've been trying to locate African inspired clothing in plus sizes. I'll be purchasing soon.